After some tough rounds of negotiations, BRICS nations (Brazil, Russia, India, China and South Africa) have created not only a new $100 billion Development Bank, but also a $100 billion foreign currency reserves pool. The announcement was made after a plenary meet of the five BRICS heads of state in Fortaleza on Tuesday. Shanghai finally won the bid to host the Bank while India will get the presidency of the Bank for the first six years. The Bank will have a rotating chair. The Bank will also have a regional office in Johannesburg, South Africa. 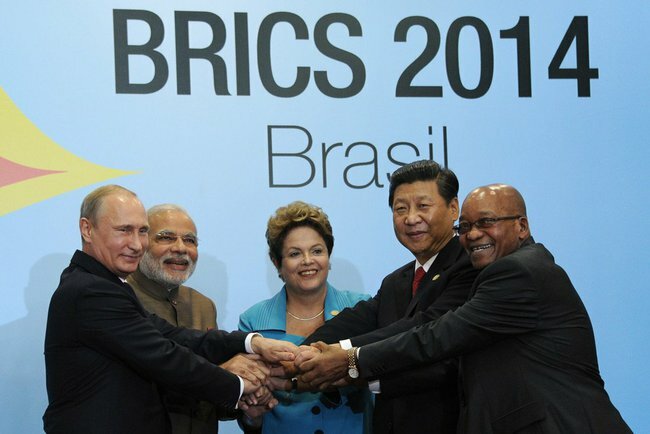 All the five countries will have equal shareholding in the BRICS Bank. The five Finance Ministers will constitute the Bank’s board which will be chaired by Brazil. The Bank will initially be involved in infrastructure projects in the BRICS nations. The authorized, dedicated and paid in capitals will amount to $100 billion, $50 billion and $10 billion respectively. The idea of the BRICS Bank was proposed by India during the 2012 Summit in New Delhi. BRICS have long alleged that the IMF and World Bank impose belt-tightening policies in exchange for loans while giving them little say in deciding terms. Total trade between the countries is $6.14 trillion, or nearly 17 percent of the world’s total. The last decade saw the BRICS combined GDP grow more than 300 per cent, while that of the developed word grew 60 per cent. Apart from the new development Bank, the group of five leading emerging economies also created a Contingency Reserve Arrangement on Tuesday. BRICS central banks will keep their resources in their gold and foreign currency reserves. China will fund $41 billion, Brazil, India and Russia $18 billion each and South Africa with $5 billion. The funds will be provided according to a multiple. China’s multiple is 0.5, which means that if needed, the country will get half of $41 billion. The multiple is 2 for South Africa and 1 for the rest. BRICS Finance ministers or central banks’ governors will form a governing body to manage the CRA while it will be presided over by the BRICS President. The BRICS CRA will not be open to outsiders. Meanwhile, at the Summit in Fortaleza, Russian President Vladimir Putin said BRICS must form an energy alliance. “We propose the establishment of the Energy Association of BRICS. Under this ‘umbrella’, a Fuel Reserve Bank and BRICS Energy Policy Institute could be set up,” Putin said on Tuesday. BRICS Development bank ! A great initiative against the western dominated IMF & WB. BRICS HAILS !! Despite this, We should create a alliance like NATO to counter terrorism & war against BRICS & its ally. And, efforts should be made to reduce the dominance of US $ across the globe. Superb. .finally we made it …brick bank into reality. Next As Russian president suggested energy alliance will be a great idea and very useful. A bold move indeed. But the challenge is ahead against other established banks in the world trade. The key issue here in my view is, the member nations should start working towards finding a common currency to deal with other than USDollar. This would give more power for the bank and to the members. Any energy agreement between the BRICS countries should include a special line of cooperation in the scientific-technological research on the fledgling and promising field of the quantum energy or zero-point energy. All countries have substantial scientific resources in order to face such a challenge and the potential benefits would be enormous. there should be condition to foreign reserve policy i.e. Currency should be accepted in the form of BRICS nation currency only. BRICS should invite others nation for membership i.e. non-permanent membership. BRICS should be permanent member and veto should be with only BRICS. How can we contact NDB? Another predatory capitalist organization wanting a piece of the pie. When I see the member countries legislate that women and locals MUST have some part in every development project, then I’ll believe it is something new. Wait and see how they perform. Right now, the project they are planning for Mozambique will force many people off their land, send profits out of the country, and benefit only the Moz. elite. Sounds good but as long as it is not replacing one CABAL for another and the people continue to be exploited by the big corporations owned by these scum elites. I hope this is something fair and equitable for the people and not just another vehicle for another group of globalist elites wanting in on the scam currently in progress. Free energy technology will convince the people this is the real deal…..??? ?